I like both outfits. 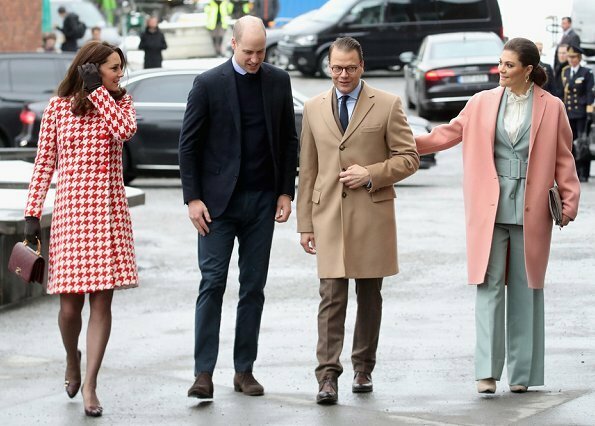 Catherine is so elegant, her coat is really nice. And I like the colours Victoria is wearing. Good improvement after yesterday's dinner. She is elegant, stylish and lovely! Catherine's bag clutching in front of her is starting to look ridiculous. It looks like that is the only way she knows how to carry a handbag. I see nothing wrong here, maybe it's a good way to carry the handbag of this type like this. I am sure she does it unconsciously. People tend to cross their arms in front of the body when they face a crowd or dozens and hundreds of photographers and cameras. It is a way to protect oneself. Many people do it. William does it all the time. I know it can be annoying because it signals insecurity and not openness, which would be nice. It needs training to get over this habit. I think most people who comment here have never stood in front of a big crowd, cameras watching each move you make. This can be challenging and it is quite a normal reaction to somehow protect yourself. Even more as she is pregnant now. She's told us the reason some years ago. It's so people will see that she's "busy" and don't have the intention to shake hands. Maybe wave to them only. If she want to shake hands, she's wearing her bag in another position. Please get rid of the Markle handbag idea. Why do you want something in your hand if you are going to have to meet people? It is easy actually :-)) When you are rigth-handed, carry the bag in your left hand, shake hands with your right hand... Where is the problem? And to carry a handbag with you, was certainly not Ms Markle's idea *Lol* Have a look at HRM The Queen. She is around carrying her famous handbag for ages. Handbags and shoulderbags are back in fashion for about two or three years now. Letizia and many other royals wear them. And it is really a nice change after these endless years of clutches. And anyway, if you wear a clutch, same situation, you have to hold it with one hand, you greet with the other. As said above. It is easy! I like Cahterines outfit very much. It has a sixties approach and reminds me of Jacqueline Kennedy. The little handbag and the gloves are part of the look. The purse is a bit of a change as Catherine usually carried clutches in the past. I agree that I wish she'd stop the front clutching. Meghan carries bags/purses. 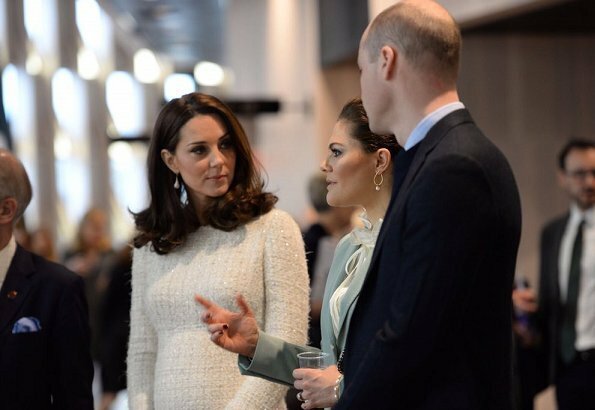 I like Catherine's winter white dress--elegant and warm. Texture of fabric adds interest. 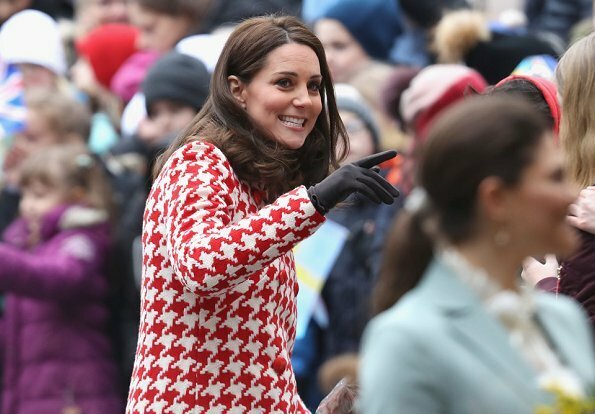 Oh, how interesting is Kate's coat - and with all the acsessories she looks fantastic! Her white dress must be beautiful, shame that we can't see it whole. I like Victoria too, she has her own style, but those trousers are too wide for her in my opinion. I like them both. Only thing I would have taken away was the belt Victoria had with her suit. Victoria... I love the colors but not together. Victoria's coat is nice but the pants suit with the baggy pants and the belt - no! Another rather matronly look. 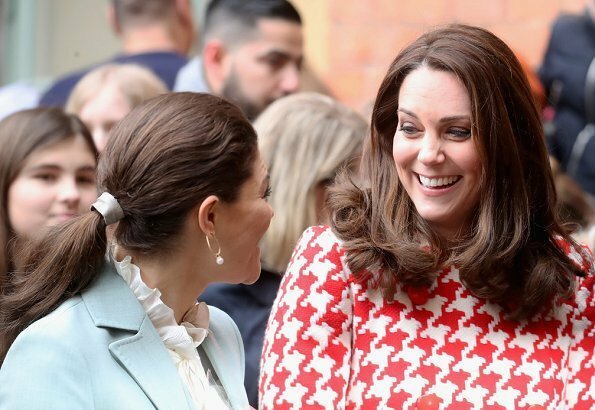 I do love the interaction between Kate and Victoria. I agree. Whether she has a handbag or nothing at all in her hands, they are almost always in front of her abdomen. Looks insecure to me. They are both very beautiful, nice coats. No comment on the husbands, i don t look to the man. I really like Daniel here. Very nice suit and shoes! Victoria's suit looks like it's almost too big, the belt doesn't really sit right and the pants are too baggy for my liking. Catherine's dress and coat are lovely, good comeback from last night. They seem to have a good time together, like it! Stunning, elegant, stylish and radiant Duchess of Cambridge. The winter white dress beautifully made from wool-blend bouclé-tweed. Stunning material. The Duchess know how to carry her handbag. The majority photos she held it to her side. Like we all do with this type of bag. Pity photos of the meeting with Oscar and Estelle and the stunning interaction between the Duchess and CP not posted here. 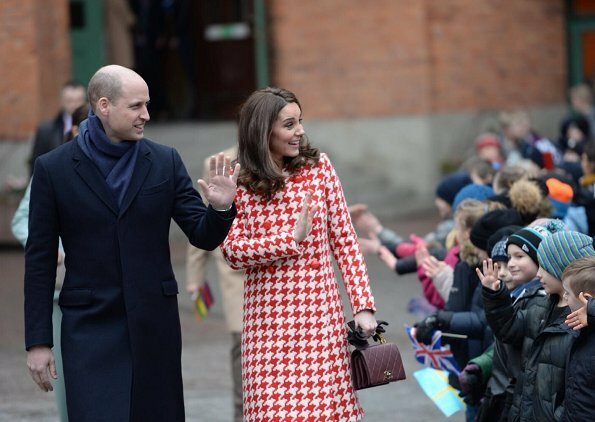 I think Catherine looks great here - love the dress and the coat. I very much like Victoria's suit and coat but I don't love the two colours together. It looks like a very friendly and warm relationship. The dress is gorgeous. So simple, but with a certain twist in the sense of material. Love it. I don't think the way she holds her bag is a big deal , I love her outfit the red and white coat us superb, although IMO if it had been one inch longer it would have been more flattering. 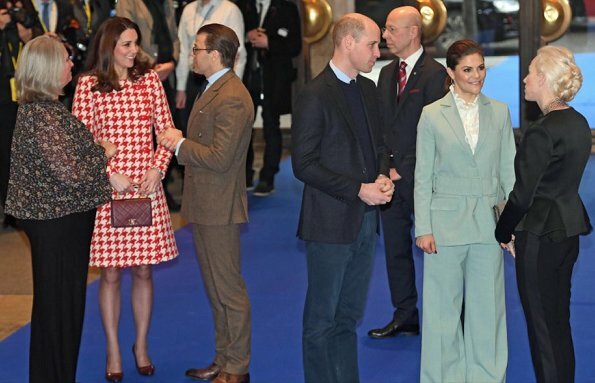 An absolute No for Victoria, the suit and coat are OK on their own, but combined they look so frumpy. This suit is modern in cut, the romantic blouse and classic pumps kill the the outfit. 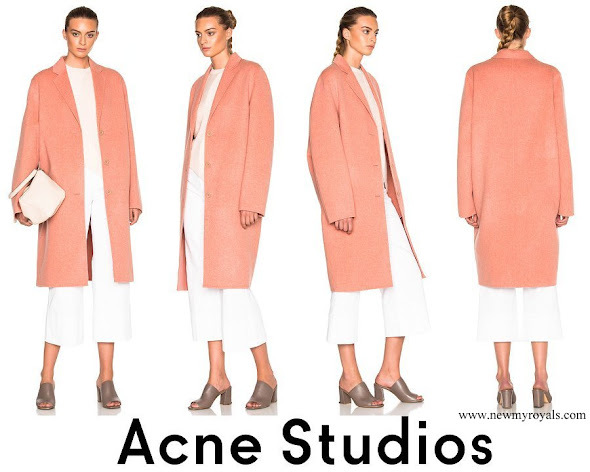 Same with the coat, it would have look fantastic over a burgundy, grey, navy blue, cream, even black simple fitted dress, too much going on over a jacket. I love Catherine's coat. I love her dress. I love her shoes, but not with that coat. And in my opinion, Victoria's suit is an absolute disaster. She looks twice her age in that outfit. I love Catherines coat but the burgundy purse and shoes do not go with the coat. I like her dress standing up. Sitting down it looks too tight on her. I wish she would stop playing with her hair. I love the colors Victoria is wearing. I also think it is sweet how Victoria is holding onto Daniels arm. I disagree with the British royals that any PDA is unprofessional. 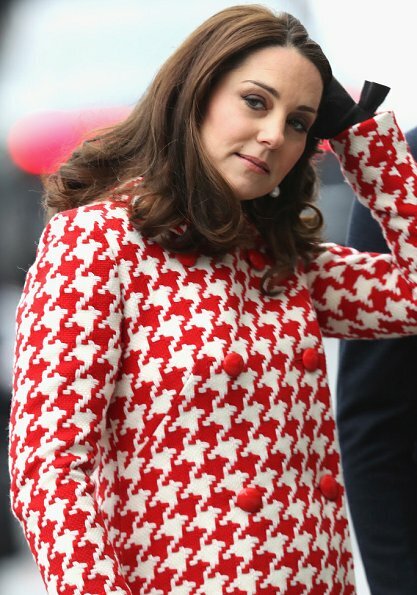 Kate is slowly turning into queen Elizabeth. It looks like she's loosing her personal style. This handbag is for grandmas. But I reaaaly love her shorter hair. Kate always holds her bag like this and Victoria always has this hairstyle. This is something we don't like but it won't change. 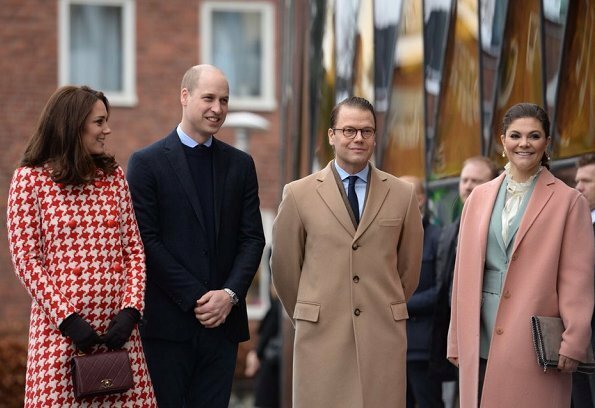 Victoria and Daniel have much better posture and body language than William and Kate. I think it is one of the most important things for royals. Look at Letizia for example. Her posture is perfect, you just know she' s a queen. Any ideas for the third baby's name? Kate a enfin un sac... Meghann serait elle copiée par Kate ...?